Is Social Media Sucking Up Your Time? 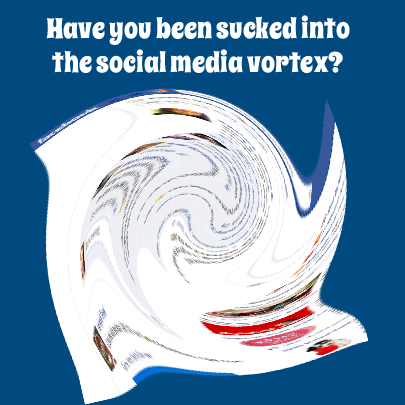 Have you been sucked into the social media vortex? It’s the easiest, fastest way to keep in touch with your connections—whether they’re local, national or international—without having to leave the comfort of your home. Social media can easily consume—and replace—your social life, and if you don’t have a strategic plan in place, it can easily become your biggest time waster. How many times have you gone on Facebook—for just a second—to post something related to your business and wound up wasting two precious hours browsing profiles of old schoolmates or former coworkers? How many courses are you in that come with private Facebook groups that you can’t keep up with? How many times have you felt so overwhelmed by your Twitter feed and everything associated with staying in the loop that you’ve declared it’s time to go on a social media sabbatical? Don’t feel bad. I’ve been there too! What kept me sane is the system that I created for myself and which I’m about to share with you. Keeping up your presence on numerous social media platforms is a recipe for disaster, as you cannot effectively keep up with all of them. If you really know who you’re serving and where they’re hanging out online, you don’t actually need to be everywhere. Choose one or two platforms and commit to interacting on them regularly. Are you on social media to increase your revenue? Do you use it to meet specific types of people (potential partners, connectors, the media)? Is your main goal to increase your brand’s visibility or build your list? Clarity about your goals creates a strong focus, which crushes overwhelm by determining what actions you need to take and what types of content you need to share on your social media platforms. For instance, if one of your goals is to establish relationships with specific businesses and individuals, create a list with their names on it so that when you’re making your social media rounds, you check up on them, respond to them, and share their content. Sharing people’s content and participating in conversations they start is an incredibly powerful icebreaker. Social media is a channel for communication and building trust. You’ve got to show your personality and demonstrate your values through your non-promotional conversations and messages. Sharing interesting and insightful information makes you look generous, informed and helpful. I love to devote some time every other day to going through new posts on the sites I follow. They get collected in my RSS Reader account, Feedly, to be exact. From there I share some of the articles right away and schedule the rest in my Buffer account. Buffer and Feedly work beautifully with one another. Overall, it takes me 15 minutes a day to look through the new posts and share the good ones. Keep your plan of action effective and manageable by dividing your efforts into two categories: preplanned and live. [tweetherder]Combining preplanned content with spontaneous interactions is essential. [/tweetherder] The Internet never sleeps, but you cannot be online 24/7 making sure you add value in real time. You don’t need to. You can as effectively share something valuable with your audience using preplanned content. Just don’t overdo it. You’re not a robot and you don’t want to look like one. Commenting on people’s updates, replying to those who’ve mentioned you, reaching out, checking in, and sharing—all these things cultivate authentic, meaningful connections. . .the kind of connections you need in order to succeed. You only need to set aside 10-15 minutes a day to maintain this very important live element of social media interaction. 5. Automation is a great thing! Your preplanned content can and SHOULD be automated. Come up with a list of updates and conversation starters, pop them into a spreadsheet like this one, schedule them in bulk using Hootsuite or Buffer and reuse them every two to three months. Of course, for visual platforms like Pinterest and Facebook (where it’s best to use Facebook’s inbuilt scheduling tool rather than an external scheduler), you’ll make different choices, but you get the idea. 30-45 minutes to schedule your updates (delegate it to your assistant, if you have one). Using this system, I can take care of all of my social media responsibilities in just 30 minutes a day. It’s not so time consuming after all! Approaching social media in a proactive, intentional way is what makes the ultimate difference. You’ll still get drawn into the social element, but my system allows you to manage your time on social media platforms more effectively. The time you save can be spent on what you love most and do best—making your clients happy—or even taking a well-deserved break. I’d love to hear what part of this structure you can apply this week. After thatm would you care to come back and share how much time it has saved you? Chat then. Natasha Vorompiova is the founder of SystemsRock, architect of business systems that work and a Certified Book Yourself Solid Coach. Her clients are small business owners who start their businesses with passion and a desire for freedom, but find themselves stuck and buried in day-to-day operations. Natasha creates systems that ensure clients get more done in less time and pave the way for greater profits and long-term success. Check out the FREE Systems Chick’s Guide to Transforming Busyness Into Business for simple ways to grow your business.